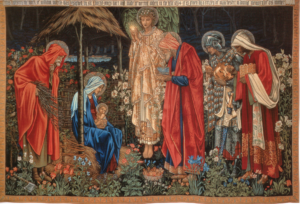 The Adoration of the Magi, tapestry, wool and silk on cotton warp (Designed 1888, woven 1894). Designed by Edward Burne Jones with details by William Morris and John Henry Dearle. Central idea: The Epiphany of the Redeemer. Doctrine: The Church is the sacrament of human unity. Practical application: Prayer for Christian unity. To view Lectionary 20 click here. The light that Isaiah prophesizes will illuminate Jerusalem and draw to her both the scattered Chosen People and the pagan nations is the light of Christ. The first persons to experience the joy of this manifestation of the salvation of the world coming from the Jews were the Blessed Virgin Mary, Elizabeth her cousin, St. Joseph, and Zechariah. After that came the lowly shepherds. And today, the Gentile magi. The promised happiness of the inhabitants of the world will stem from the Messiah-King who reigns in the New Jerusalem. Expressed in theological terms, the graces of the Redemption will flow from Christ (their source) to the world (their object) through his Church (his instrument). The reason that he will have all authority is not his capacity for inflicting violence—as is the case with any present earthly authority—but because of his goodness: his rescuing of the poor and afflicted, the category that every inhabitant of the earth is actually in if he or she has the humility and wisdom to look clearly. The word epiphany means appearance or manifestation. Literally it means showing to. We tend to think of the feast of the Epiphany as the sudden appearance of the gift-giving pagan Magi to Christ but the revelation is really the other way around. It is the manifestation that Christ is not just the savior of God’s Chosen People, the Jews, but that he is the redeemer of the whole world; that is, he is the salvation of the Gentiles, too. The foundation of the Church is none other than the Son of the living God (CCC 442). The Church will not be all God means it to be until the Jews are fully incorporated into it so that “God may be all in all” (CCC 674). The Church is “the ‘convocation’ of all men for salvation.” Thus, “the Church in her very nature is missionary, sent by Christ to all the nations to make disciples of them” (CCC 767). The Church is called a sacrament by analogy because she “both contains and communicates the invisible grace she signifies” (CCC 774). “The seven sacraments are the signs and instruments by which the Holy Spirit spreads the grace of Christ the head throughout the Church which is his Body” (CCC 774). The Church, then, “is like a sacrament—a sign and instrument, that is, of communion with God and of unity among all men” (CCC 775). The Week of Prayer for Christian Unity is January 18-25, the original days of the feasts of the Chair of St. Peter (January 18 (February 22 now)) and the Conversion of St. Paul (January 25). For over a hundred years, Catholics, Orthodox, and Protestants have joined in praying for Christian unity. This year’s theme is “The Love of Christ Compels Us,” drawn from is 2 Cor 5:14-19.